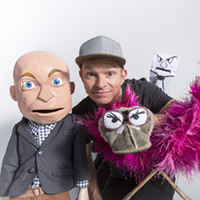 Conrad Koch, South Africa’s top ventriloquist, and his boss, SA’s most famous puppet Chester Missing, bring an hour of hilarious ventriloquism with an African flavour to Canada. Conrad, a double international EMMY-nominated comedian, as seen at JFL Montreal, gives life to everything from his own hoodie to feather dusters; makes someone talk using the Snapchat app; introduces Africa’s most dangerous animal, a vegetarian mosquito; and even turns an audience member into a lion. Grrrr. Africa’s top ventriloquist? I can’t say, but he’s a hell of an entertainer. The merriment and laughs start as soon as the lights dim and continue through the entire show. The opening “guest” feels like what you’d normally see from a ventriloquist act, but performed expertly nevertheless. The next characters that take stage are out of this world whacky, with hilarity ensuing. If you’re adverse to being in the public eye, you should probably stay away from the front row.